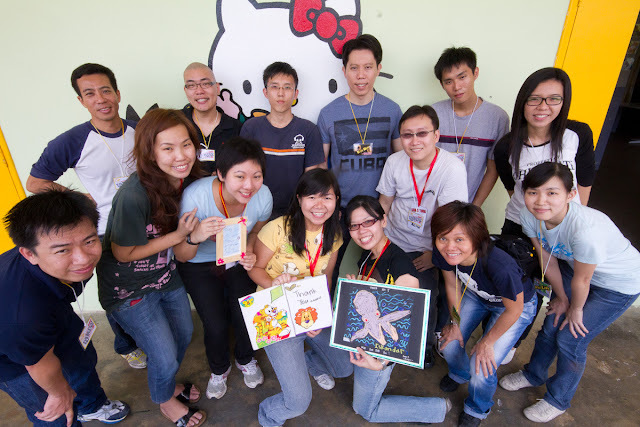 As part of the programs of Toa Payoh Central CC I volunteered to teach and play games with kids at the Pertapis Children's Home. The day started relatively early at 9am or so. We had previously discussed and rehearsed the games we are going to play and how to facilitate the session. We brought a variety of games from Ubongo to Ugly Dolls. All the games could be taught in five minutes. In the end the kids had a great time and we all can't wait for the next visit! Back at the cathedral Father Andre escorted them to the refectory to provide some refreshments for the group. There they were met with a nun, Sister Marie who was acquainted with Joseph. Pierre narrated what happened leaving out any mention of demons. Father Andre then presented to Pierre a black box contain the pistol he requested for with 2 clips of ammunition. A novice arrived to advise Father Andre of a commotion out the front who left the group to investigate. Harumi and Sister Marie decided to follow to see what the fuss was about. They peeked out ...to see Father Andre in agitated conversation with a group of gendarmes. They could just make out a man identifying himself as Chief Inspector Lauvin who wanted to arrest persons matching the description of Pierre, Joseph and Harumi for the murder of Eric Gilbert.